The days of newly weds looking at house payments as their first large debt have apparently come to a close. 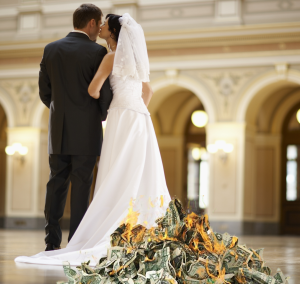 So what’s the new top-dog dollar sign attached to the prospect of marriage? By a wide margin, it’s the cost of the wedding itself. The modern age has changed many things. For one thing, there’s the internet: we can see what everyone’s up to all the time, and we can talk about it with each other even when we’re miles apart. In terms of marriage, one thing this technology has changed is our ability to see what we’ll miss if we don’t shell out tons of money for the Big Day. Social media is also helping with this encouragement to spend, spend, spend. Who hasn’t seen an at least a couple of extensive Facebook photo albums filled with memories from our friends’ and acquaintances’ dreamlike nuptials? If Jimmy and Jane across the street can afford those royal flower arrangements, why can’t we? Well, I suppose we can if we’ve already saved up the dough, but many of us simply do not have $31,000 to throw down for even the biggest party of our lives. And yes, studies show that this is indeed the new average cost of weddings in the United States. Imagine sharing enormous financial debt with someone who probably isn’t too crazy about you. Chances are, it’s going to be quite the battle to make sure that you’re not the one burdened with most of it. Things can, and do, get very nasty in these types of divorces. Tennessee Divorce Debts: Where Do They Go? In the state of Tennessee, and probably several other places across the nation, infidelity is a leading cause of divorces. The internet has so graciously made it as easy to cheat as it is to order, well, anything. It’s a temptation that many are unable to refuse. When these situations happen and the divorce papers are filed, one can probably guess where the debt for outrageous wedding expenses fall: right on top of the cheater. This can be troublesome – if a couple was already sharing the debt, then how on earth would one of them be able to pay it off on his or her own? At Turner Law Offices, P.C., we have years of experience with divorces in all kinds of circumstances. Even if you’re already facing problems from having a wedding you couldn’t afford, we know how to best negotiate terms that are reasonable for all parties involved. You don’t have to drown in financial stresses – call today or go online to set up your Free Initial Consultation with one of our seasoned attorneys, who are ready and waiting to do whatever it takes to make sure you stay afloat after even the nastiest divorce.